Dr. Qazi Abid (Professor, Bahauddin Zakariya University, Multan, Pakistan) "The reflection of post 9/11 Pakistani Society in Urdu literature"
Dr. Anwaar Ahmad, (professor, Bahauddin Zakariya University, Multan, Pakistan, Former Chairman National Language Authority, Pakistan,) " Mystic narrative of Islam in South Asia widely accepted by great poets of Persian,Urdu and major languages of Pakistan". Timsal Ahmad (The Alfalah Institute of Banking and Finance, Bahauddin zakariya University, Multan , Pakistan) "Islam and Modern Technology: An Exploratory Analysis of the South Asian Region"
One cannot deny the importance of Science and Technology in the modern era. Majority of the human beings (educated or uneducated) living on planet earth today use technology in form or the other. But, the question is how can we relate the modern concept of science and technology with centuries old concepts of religion? In Islam, the first word 'revealed' to the messenger of God was to "READ", which signifies that foundation of this religion is based on knowledge. Therefore, today we see the Islamic world getting transformed through science and technology. The South Asian region comprises of a large segment of world's Muslim population, therefore it is very interesting to witness how technology is changing the life a common Muslim person in this region. 13:20-14:50: Keynote Speeches (co-hosted session) Prof. Dr. Mehmet Asutay (Durham University) "Islamic Banking and Finance: Negotiating through Postcolonial Perspectives"
Prof. Dr. Yasushi Kosugi (Kyoto University) "A Vision of Islamic Revival and the Philosophy of a Halal Life: Framing Islamic Economics in a Global Perspective"
Dr. Hanimon Abdullah (Durham University) "An Exploratory Examination into the Relationship between Corporate Governance and Risk Management Practices in Islamic Banks"
Dr. Noor Zahira Mohd Sidek (Durham University) "Does Political Regime, Governance and Political Risks Matter for Islamic Banking?" Hajar Raouf (Durham University) "What Do Risk Governance Frameworks Tell Us about Banks' Financial Performance? The Case with Islamic Banks"
Banjaran Indrastomo (Durham University) "Emergence of Islamic Economics Movement in Indonesia: A Political Economy Approach"
Kentaro Kambara (Kyoto University) "How does Modern Islamic Finance Reconstruct Traditional Pawnbroking (Rahn)? A Case Study of Brunei Darussalam"
Amirul Haqeem Bin Abd Ghani (Durham University) "Social Disclosure: A Comparison between Islamic and Conventional Banks in Malaysia"
Dr. Iyas Salim (Doshisha University) "Filling in the Void? 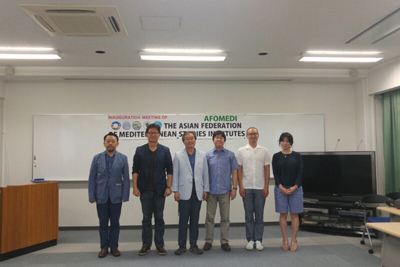 Post-Conflict Palestinian Society between Mitigation of International Official Aid and collaboration with Global Civil Society"
Kensuke Yamamoto (Kyoto University) "Contestation over Jerusalem's Sacred Sites: Can Be Shared or Divided?" Shun Watanabe (Kyoto University) "Comparative Politics of the Monarchies: A Preliminary Discussion on Western and Arab Monarchies"
Fukiko Ikehata (Kyoto University) "Religious Conflicts in the Modern Middle East: Understanding Jordan in a Sunni-Shiite Ternary Rivalry"
Hiroyuki Shiomi (Kyoto University) "Does Iran seek Leadership at Islamic Ummah? A Preliminary Discussion on Iran's International Strategies"
Chiaki Higa (Kyoto University) "Socio-economic Development of Abu Dhabi and Transformation of Women's Living"
Midori Kirihara (Kyoto University) "Afghan Diaspora Community from Afghanistan: How Do They Make Culture and Identity"
Dr. Shinsuke Nagaoka (Kyoto University) "Reconsidering the Role of Traditional Islamic Economic Institutions for Community Welfare: New Paradigm or Mimic Capitalist Model?" Mari Adachi (Kyoto University) "New Wave of Zakat Practice in Indonesia: Reconsidering Top-down and Bottom-up Dichotomy Framework"
Isa Yilmaz (Durham University) "Constituting Islamic Social Welfare Function: An Exploration in Islamic Moral Economy"
Marie Sato (Kyoto University) "Mapping the Socio-Ecological Changes in Refugee-Influx in the Middle East: Reflections on the Case of Jordan"
Khashan Ammar (Kyoto University) "The Quran's Prohibition of Khamer (Intoxicants): A Historical Analysis for Global Islamic Economics"
Turgay Kart (Durham University) "Islamic Venture Capital Models for Financing SMEs in Turkey"
Dr. Harun Sencal (Durham University) "Capitalism as Sovereign: Critical Reflections on the Practice of Islamic Finance"
"Al-Biruni's Paradigm of Mathematical Research"
"Religion, Law, and Foundational Commonality in Contemporary Egypt: Tariq al-Bishri's Views on a Political Community"
"Position and Strategy of Jordan: Islamic Diplomacy in the Middle of Confrontation"
"A Solution to the Jerusalem Problem? : Preliminary Discussions based on the Case of Al-Khalil/Hebron"
"Jordan in Syrian Crises: Politics of Refugees and Mitigating the Burden of Neighbors"
"Diversity of Zakat Practice in Indonesia: Toward an Analytic Framework"
"How Tunisian Muslims Treat Religious Materials: Focusing on Qur'anic Ornaments and Calendars"
"Political Elites and Social Mobility in Bourguiba's Tunisia (1956-1987)"
"Translating Wahda al-Wujud into Saiva Theology: A Reading of the First Chapter of Srivara's Kathakautuka, a Sanskrit Translation of Jami's Yusuf u Zulaykha." "Mawlid and British People in Egypt"
"Tribalism in the Political Context in Libya: Qadhafi's Discourse and its Influence"
"New Strategy for the Maintenance of the Authoritarian Regime in Morocco: 2011 Parliamentary Elections and the Nominal Change of Government"
Joined Foreign Service of Pakistan in 1984. He holds BSc Honours degree in Physical Geography from University of Manchester; MSc. in Transportation Planning and Management from PLC/University of Westminster, London and Masters Degree in Law & Diplomacy (MALD) from the Fletcher School, USA where he also completed the PhD Comprehensive Examinations. He has also undertaken the National Security War Course at the National Defence University, Islamabad. He had various diplomatic assignments in Pakistan Missions abroad -Cairo (Second Secretary, 1992-1995), Ankara, (First Secretary, 1995-1999), Washington (Political Counsellor, 2002-2006) and Pakistan Mission to the United Nations in New York (Ambassador/Deputy Permanent Representative, 2006-2009). He served at Headquarters at Desk Officer, India/UN (1986-1991), Director, UN/Africa (1999-2002) and Additional Secretary, Foreign Affairs at the Presidency (2010-2011). 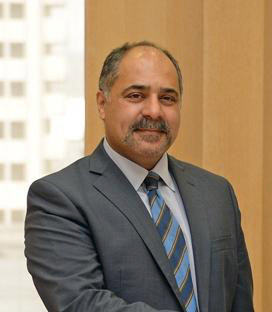 Before being appointed as Ambassador to Japan he served at the Foreign Ministry as Director General (CWC National Authority/Disarmament) since February 2012. 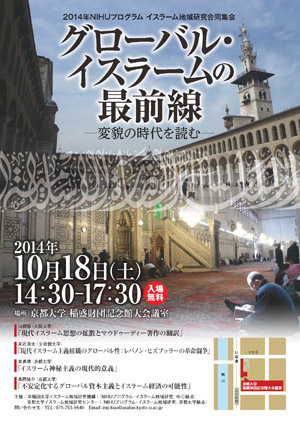 講演タイトル："The Significance of Southeast Asia ('the Jawah World') in the Global Study of Islam: In Historical as well as Contemporary Perspectives"
講演タイトル："Palestine and the International Statebuilding Agenda: A Way Forward to Peace?" Dr. Nur Indah Riwajanti (Visiting Associate Professor, Kyoto University) "Islamic Microfinance in Indonesia: Development, Challenges and Contribution"
"The Role of the Shari'ah Department in the Bank Islam Brunei Darussalam"
"Theory and Practice of Rahn (Pawnbroking) in Islamic Finance: Its Characteristics of Brunei Products"
"Zakat Practice in Indonesia: Its History and Contemporary Issues"
"Riba and Bay'a: Reflections on the Qur'anic Verses, Prophetic Traditions and their Interpretations"
"Historical Turbulence and the Regime Stability of the Hashemite Kingdom of Jordan: A Study on its Internal and External Political Process from the 1967 War to the Black September"
"Arab Uprising and the Unfolding Civil War in Syria"
"Amman Message from Jordan: Sunni-Shiite Conflicts and Path to Reconciliation in the Middle East"
"Judaization Policy and Palestinian Resistance in the Old City of Hebron / al-Khalil"
・"Education in Muslim Societies: Learning from the Past" in Basit, Abdul (ed.) (2012): Global Muslim Communities at a Crossroads: Understanding Religious Beliefs, Practices, and Infighting to End the Conflict, Praeger: Santa Barbara. ・"Islam: A system of Salaam/Peace" in Dietrich, Wolfgang et al (eds.) (2011): International Handbook on Peace, Palgrave McMillan: London/New York. 題目："Agrarian Relations, Reform, and Peasant Protest in the 19th-century Ottoman Empire"
タイトル："Islamists, the Military and the 25th January Revolution"
・A.F.Mathew (ed. ), Some Essays on Postmodernism, Globalisation and the Media, Ahmedabad: MICA Publications, 2008. ・A.F.Mathew, "Some Narratives on Kashmir and the Indian Media", Journal of the Indian Anthropological Society, Vol. 41, No 3, 2007. "The Possible Solution of the Alevi Issue in Turkey"
"Ethics and Education: Comparison between al-Tariqa al-Qaridiya and al-Tariqa al-Rukayniya in Sudan"
"Islamic State and Religious Coexistence: Visions of Islamic Intellectuals in Egypt"
"Nationalism, Confessionalism and Democratization: Reflections on Civil War in Syria"
"A Study on Electronic Culture Atlas for Mediterranean Region Research"
"Maghrebi stardom in contemporary French cinema: the case of Sami Bouajila"
"Islamic NGOs in the Contemporary Middle East: A Case of Jordan"
"People 2 People Empowerment Muslim Civil Society in Turkey and its Transnational Development Role in Palestine"
"Islam and Religious Coexistence in Egypt: Preliminary Discussion"
"Authoritarianism, Representation, and Political Participation: An Egyptian Dilemma"
"Politics of Demography and Palestine Question: A View from al-Khalil / Hebron"
"The Role of Intermediate Group and the Social Relationships of Childcare: A Case Study of Integrated Child Development Services in Delhi, India"
"Islamists' Perspective on Good Governance and Human Rights: Pertubuhan Jamaah Islah Malaysia (JIM)'s involvement in Abolish Internal Security Act (ISA) Movement (Gerakan Mansuhkan ISA), 2000-2012"
"Can Islamic Micro-financing Improve the Lives of the Clients: Evidence from a Non-Muslim Country"
"Exploring the Role of Islamic Microfinance Institution in Poverty Alleviation Through Microenterprises Development,　A Case Study of Indonesia"
"Islamic Retail Financial Products in Malaysia: Japanese Reflections"
"Locating Islamic Moral Economy within Emergence Economics: A Search in Post-Capitalist Era"
"Principal and Strategic Tasks of Islamic Economics in the Current and Coming Decades"
"Revivals of the Traditional Islamic Economic Institutions with Novel Devices in the Second Decade of the 21st Century"
"Social Welfare Functions and Public Choice from the Islamic Political Economy Perspective: Correcting the Failure of Islamic Banking and Finance"
"Islahi Social Capital: a Conceptual Approach Towards Faith-Based Development and Poverty Alleviation"
"Parallel Universes - What Islamic Finance can learn from Socially Responsible Investment"
"The Relationship between Corporate Social Responsibility Disclosure and Financial Performance: Empirical Evidence from GCC Islamic Banks"
"Examining the Sharia compliancy and the Realisation of Maqasid Al Sharia at the Contractual and Socio-Ethical Levels: The Case for Islamic Project Finance"
"Islamic Finance's Exit from Dubai Shock: An Assessment of Dubai Approach from Financial Dispute"
"Economic Significance of Mosque Institution in Malaysia"
"Islamic Microfinance in Indonesia: An Empirical Research"
"Islamic Reformist Movements and the Cult of Holy Relics"
高尾賢一郎（同志社大学）“Chapter 1: Origins, Foundations and Rivalries (850-1100),” Nile Green, Sufism: A Global History, Chichester: Wiley-Blackwell, 2012, 15-70. "Sadaqa in Religious Tourism: The Gift Economy in Syrian Shi'ite Visits"
"We Don't Want Union! We Want Our Country! : The Independence Movement in Zanzibar"
"Between the Understanding about Christianity and French Occupation of Algeria: According to al-Amir 'Abd al-Qadir al-Jaza'iri"
"Reformation of the Image of Saints through Maulid Cerebrations in Contemporary Malaysia"
"The Controversy between Sayyid Alawi Tahir al-Haddad and Ahmad Hassan:The traditional Shafi'i School and the Salafi movement in Southeast Asia in the 1930s"
"How Had People become 'True' Christians? 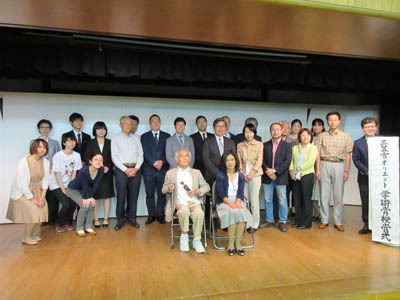 : Kuku's Migration and the Christian Revival Movement in Greater Sudan"
"Clashes, Conflict and Contradiction: Sufi Power Struggle in Sudan"
*Professor Cook's attendance at this workshop was made possible by the generous support of the Japan Society for the Promotion of Science (Invitation Fellowship Program for Research in Japan [Short Term]). "Brunei Darussalam as a Traditional-Modern Malay-Islamic State"
"Environmental Issues among the Muslim Community in Brunei Darussalam"
"Islam and Japan: Historical Backgrounds and Current Issues"
"Islamic Finance and Japan: Recent Developments"
講演タイトル：　"How Has Israel Become the Darling of the Right-Wingers?" 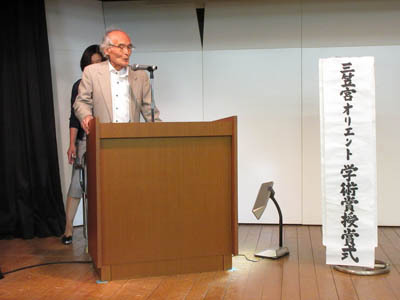 "New Horizon of South Asian and Pakistan Studies in Japan"
"Narrating the Life of a Man Known as Shaykh: Narratives on al-Hajj'Ali al-Darqawi by Mukhtar al-Susi and Others"
"Western VisualRepresentations of Sufism and Dervishes from the 14th century to early 20th Century"
"Local Society and Participant Observation: The Mausoleum of Fakir Lalon Shah in contemporary Bangladesh"
"A Secularized Hagiography of a Muslim Saint: (Batal al-Islam), Hero of Islam, or How Political Commitment Leads to Sainthood for an Iraqi Shia Religious Leader"
"Democratization and Separatist Conflict Settlement in Aceh, Indonesia"
"The Influence of Military Reform on Indonesian Foreign Policy: A Case Study of the Participation of Indonesian Military in United Nations Peace Keeping Operations"
"The 2011 Arab Uprising and the Prospects for Democracy in the Middle East and North Africa: The Case of the Arab Republic of Egypt"
"Historical Circumstances and Sustainability of Life in Greater Amman: Its Development into a Modern Metropolis with Refugee"
"Relational Approach to Palestinian Intifadas: "Violence" and "Nonviolence" in Contentious Actions"
"Research on a Changing World of the Middle East: The Way Forward"
"Dubai Approach as a Frontier of Dispute Resolution for Islamic Finance"
"The Iraqi Press and Opinion Freedom during the Economic Sanctions"
"Contemporary Role of the Merchant Class in the Kuwaiti Economy"
"The Politics of Religious Diversity in Egypt: Discourses on Religious Minorities in the Colonial and Post-Revolutionary Periods"
"Who Lost the Game? : The Democratic Transformation: a Battlefield of Internal Political Actors in Post-Conflict Sudan"
"The Scope and Tasks of Islamic Economics: An Civilizational Approach"
"Are Sukuk Debt or Equity? Revisiting Theory in Islamic Economics and Finance"
"Agency Problem in Islamic Partnership Contracts"
"Dynamics of Islamic Economics after the Boom of Islamic Finance: A Vision for Neo-Capitalism or New Universal System?" "The Application of Hibah in Takaful and Insurance Policy: A Comparison Study between Malaysia and Singapore"
"The Applicability of Waqf Instruments in Activating Idle Agricultural Land in Malaysia"
"Innovation of Dispute Resolution for Islamic Finance in Dubai: Ad hoc Approach or Products-Oriented Approach?" "The Prospect of Gold Dinar as a Currency: Physical or Gold Backed?" 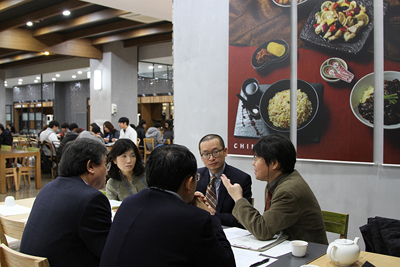 "Prospect, Challenges and Shariah Issues of Gold Investment in Malaysia"
演題： "Madrasas and Militancy? : Understanding recruitment for Jihad in Pakistan"
"Saints Veneration and Holy Portraits in Shia-Sunni Contexts"
"Tolerance or Intolerance? : From the Confrontation between Sufi and Salafi in Mawlid al-Nabi"
"The Social Development Theory of Shah Wali Allah"
"Perfect Man according to 'Abd al-Wahhab al-Sha'rani: From the Ontological Point of View"
"The Revival of Nayruz Festival in Modern Egypt"
"The Role of ?Ulama in the Modernization of Education in Egypt Late in the 19th Century: Focusing on Rifa'a al-Tahtawi and Muhammad `Abduh"
"The Role of Media in the Formation of the Image of Middle East and Muslims in Japan, and the Formation of Japan Image in the Middle East"
"Reviews of Former Studies on Sexuality of Iranian Women: From the Perspective of 'Strategy' in Everyday Life"
"Maitatsine, Islamic Brotherhood or Political Party in Northern Cameroon and Nigeria." "A Consideration of "The Rif Nationalism": in Relation with the Rebellion of `Abd al-Karim"
"Indonesian NU and Khittah 1926: Questioning the Role of NU in the "Reformasi" Era"
"Culture of Islamic Learning in Contemporary Malaysia: the Role of Traditional Elements"
Armando Salvatore is a sociologist of culture and communication who investigates various dimensions of religious traditions and secular formations in historical and comparative perspective and works on public sphere theory. He teaches at the University of Naples 'L'Orientale', Dept. 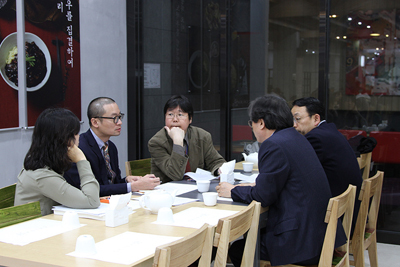 of Social Sciences, and is a project director at the Humboldt Center for Social and Political Research, Berlin. His latest book is The Public Sphere: Liberal Modernity, Catholicism, Islam (Palgrave 2007, pb 2010). "Rereading the Role of New Media in the 'Arab Spring'"
国際ワークショップ The Iraqi - Japanese International Workshop at Kyoto University "Japanese and Iraqi Studies in two Perspectives"
"Conflict, Collapsed State and Social Movements in the Contemporary Asia and Middle East"
Ahmed Amir ISMAIL (TUFS): Why the popular uprising in Iraq has failed in achieving its goals? "Struggling Muslims in the Modern and Present-day Eras: Political, Social and Religious Aspects of Their Endeavors"
Sufism as a Tool of Intercultural Dialog: Case of "Sufi for a Month"
"Does Islamic Finance Make the World Safer? Assessing Financial and Social Performance"
"Classifying Islamic Financial Markets: Dimensions and Japan's Positioning"
"Predicting Banking Distress Using Emerging Market Z"-Score Model: A Comparative Study on Islamic and Conventional Banks in Malaysia"
"Challenges of Having Genuinely Debt Based Financing of Islamic Mortgage: A Case of Musharakah Mutanaqisah Home Financing in Malaysia"
"Service Quality, Customers Satisfaction and Awareness of Islamic and Conventional Banking in Malaysia"
"An Exploration of Social and Financial Performance of Islamic Banks in Malaysia"
"From Shari'a-Compliance to Shari'a-Based Islamic Economic System: A Proposal"
"Examining the Performance and Productive Efficiency of Islamic and Conventional Banks in Saudi Arabia"
"Domestic Energy Policy in Saudi Arabia: Focusing Power Sector"
"Evaluating the Current Banking System and Dispute Resolution: The Case of Islamic Finance in the United Arab Emirates and Malaysia"
"Islamic Economics in the Second Decade of the 21st Century: Revival of Mudaraba Consensus or New Horizons?" "Can Financial and Social Performance of Zakah Institution be Assessed Using the Maqasid al-Shariah Approach?" "Agricultural Product and Loss Sharing (aPLS) as A New Formulation in Islamic Finance for Agriculture"
"Unity and Diversity of Mediterranean World"
Prof. Dato' Dr. Mohd Yusof Hj. Othman (Universiti Kebangsaan Malaysia) "Tauhidic Science: Why and What?" "Asian Models of Modern Life in the Age of Globalization: From Japanese and Malaysian Perspectives"
Prof. Dr. Abdul Latif Samian (Universiti Kebangsaan Malaysia) "Tauhidic Mathematic"
Muhammad Hakimi bin Mohd. Shafiai (Kyoto University) "The Potential of Islamic Agricultural Finance in Malaysia"
KAWAMURA Ai (Kyoto University)"The Modification of the UAE Legal System for Islamic Finance"
HAGIHARA Jun (Kyoto University)"Economical Development of Saudi Arabia's Private Sector"
SUNAGA Emiko (Kyoto University)"Translation, Adaptation and Indigenisation of Knowledge: An Introduction to Exegesis of the Qur'an in South Asian Languages"
CHIBA Yushi (Kyoto University)"The Arab Media and New International Information and Communication Order(NIICO): A Historical Review"
Dr. Ranjit Singh (Associate Professor, University of Mary Washington) "Some Reflections on the Arab Spring"
1. IMAI Shizuka (Kyoto University) "Transformation of Jordan's External Trade in the 2000s: An Analysis of Economic Policies Dealing with the Challenge of Globalization"
2. Nutan Sharma (Tokyo University of Foreign Studies) "Grass to Guns: Women in the Maoists Insurgency in Nepal"
3. 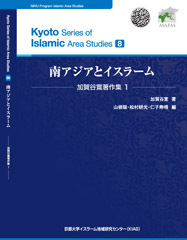 KAWABATA Aruma (Kyoto University) "Halal Meat Market in the Islamic World"
1. KAWAMURA Ai (Kyoto University) "Dispute Resolution in Islamic Finance: A Case Study of the United Arab Emirates"
2. HAGIHARA Jun (Kyoto University) "Saudi Arabia as a Petrodollar Driven Consumer Society: Review of Preceding Works and Proposal of a New Perspective"
3. Patrick Mason (Tokyo University of Foreign Studies) "Webs of Contention: A Network-based Analysis of the Insurgency in Afghanistan"
1. SUNAGA Emiko (Kyoto University) "Tafseer Literature in Print Media: A Survey of the Quranic Interpretation in South Asia"
2. ZOU Yi (TOKYO UNIVERSITY OF FOREIGN STUDIES) "Students Anti-Japanese Sentiment and Policy Implementation toward Anti-Foreign Policies in Contemporary China: A Case Study in Yunnan Province"
3. 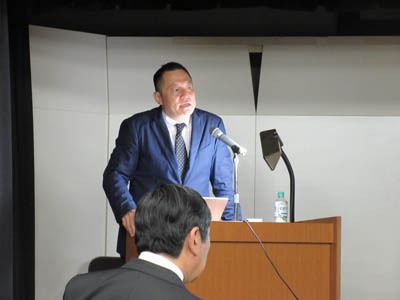 OHASHI Kazuhiro (Kyoto University) "Islamic Revival in Early Modernity: A Preliminary Study on Al-Shawkani in Yemen"
1. Ladislav Lesnikovski (Tokyo University of Foreign Studies) "Identity politics in the Balkans: The slavic muslim minority in Kosovo"
2. Nicolas Ballesteros Lopez (Tokyo University of Foreign Studies) "Roma - Ashkali and Egyptian Communities in Kosovo and the Impact of the International Community (1999-2008)"
1. Muhammad A. Ahmad Duhoki (Tokyo University of Foreign Studies) "Turkey's Kurdish Question: Demands and Sensitivity"
2. 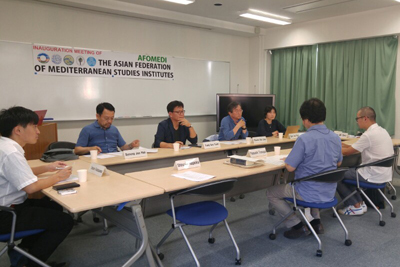 SATO Marie (Kyoto University) "Life of the Iraqi Refugees in Jordan: A Field Research Report"
遠藤春香（京都大学）Carl W. Ernst, “What is Sufism?,” in Carl W. Ernst, The Shambhala Guide to Sufism, Boston & London: Shambhala, 1997, 1-31, 229-230. Date:24 and 25 July, 2011. 14:10-14:40 Idiris Danismaz (Turkey Japan Cultural Dialog Society) Interpretation on Ibn Arabi's Thought in Contemporary Turkey: 'the Perfect Man' in Gulen's　"Kalbin Zumrut Tepeleri (Emerald Hills of the Heart)"
二ツ山達朗（京都大学）"Chapter 7: Sufi Music and Dance"
内山明子（京都大学）"Chapter 4: The Names of God, Meditation, and Mystical Experience"
"Sufism in Contemporary Turkey: Interpretation of Ibn Arabi's Thought in 'Kalbin Zumrut Tepeleri (Emerald Hills of the Heart)'"
"The Concept of Spirit (Ruh) in Hujwir's Unveilling the Veiled (Kashf al-Mahjub)"
"Mujaddidi Branches among Hui People of Gansu, Qinghai and Ningxia: A Preliminary Account"
"The Genealogy (nasab) of Imam Shafi'i through the Analysis of Hagiographic Sources"
"The Actual Conditions of Women in Contemporary Iran: Through their Visit to 'Emamzadeh'"
"The Role of Christianity among Kuku in Khartoum: Function and Management of Communities"
"The Problems That Muslims Face in Japan"
"The Discourses about al-Amir 'Abd al-Qadir al-Jaza'iri among French and English People"
"The Socio-Political Transformations of Contemporary Palestine and the Electoral Participation of Hamas: The Process of Change of Organizational Structure and Political Opportunities"
"Mindful of their Origins while Residing in the City: The Experience of Migrants and their Descendants from Upper Egypt in Alexandria"
"Developing Tourism Industries for Formation of Tunisian National Image"
"The State of Middle East Studies in the American Academy"
“Webs of Contention: A network-based analysis of the insurgency in Afghanistan"
"Jordanian Iraqi Trade in the 1980s: Reflection on Internal and ExternalFactors"
"The Kurdish ethno-nationalism and Identity in Turkey"
"Islamic Law and Modern Methods of Slaughtering: A study of Halal Meat"
"Farmers' Life in Malaysia and their Land Use Problems: Can Be an Islamic Solution?" "The politics of Muslim identities in the Balkans"
"The Roma minority:Analysis of the exclusion in the post-conflict Kosovo (1999 - 2009)"